Take one of Bob Dylan’s early songs, “The Times They Are A-Changing”, Woody Guthrie’s “Dust Bowl Ballads” and The Weavers’ rendition of “What Side Are You On,” a song originally written for the United Mine Workers Union in Kentucky in the early 1930s, shifted slightly to bring attention to the growing fears of Communism and McCarthyism in the 1950s. All of these songs were powerful then and still very much are today, as well as being important documents of the American fabric of history, how the music has shaped our people as a country, and how change in our society has been brought through by the platform of music. The exact same can be said of John Lennon and his Plastic Ono Band’s “Power To The People” song, written and released in 1971. 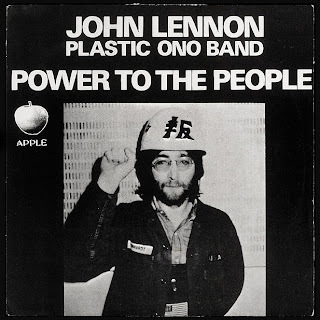 Lennon himself may have had misgivings about the song years after it was recorded, but I think today he might have a different opinion with the ‘Occupy Wall Street’ movement gathering traction and momentum coast to coast. Sure, “Power To The People” has massive commercial appeal, but that’s how songs get radio play, right? As much as Lennon was an activist in his day there is no doubt he would be tickled (to say the least) to see and hear this tune sustain itself as an anthem for the ‘people to sing.’ If nothing else the song is just badass, and sax player Bobby Keys just makes you want to shake your booty for about three minutes straight. As with every Lennon single during this time you got a little bit of Yoko Ono, too. Her contribution on the flip side, “Touch Me,” is nearly four minutes of vocal orgasmic gyration put to the sounds of feedback infused guitar, not at all as painful to one’s ears as you might imagine. Think of the song more as a sound collage or recorded performance art, which is what I expect Ono was going for on this song; a sonic impromptu session of her and Lennon ‘doing it’ via vocals and distortion. 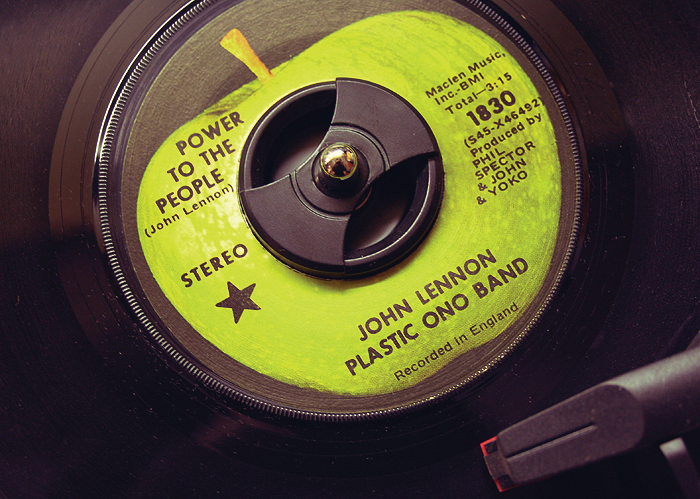 From Ono’s artist background, and Lennon’s genius of experimentation and the sheer want to create art with the woman he loved so dearly, “Touch Me” works amazingly well, a song I’d be all too happy to play on the jukebox (if bars still carry vinyl jukeboxes these days) my next time out on the town with loose change burning a hole in my pocket. This entry was posted on Friday, October 28th, 2011 at 10:44 am	and is filed under Music, Reviews. You can follow any responses to this entry through the RSS 2.0 feed. You can skip to the end and leave a response. Pinging is currently not allowed.